The San Francisco Giants are heading to the World Series to battle the Kansas City Royals after a 6-3 win over the St. Louis Cardinals during game 5 of the series on October 16. Travis Ishikawa sealed the win over the Cardinals with a three-run homer in the bottom of the ninth inning. LOS ANGELES, CA (Catholic Online) - Travis Ishikawa helped sink the win with a three-run homer in the bottom of the ninth inning, and the Giants-who have been to the World Series in three of their last five seasons-are eager to continue their postseason run with a chance for a third championship. Combat corruption with moral education; send a Bible to a child, or another person in need. "You just feel it with this team," said Ishikawa. "When you've got guys who have been there and done it before, there's a confidence you can feel." 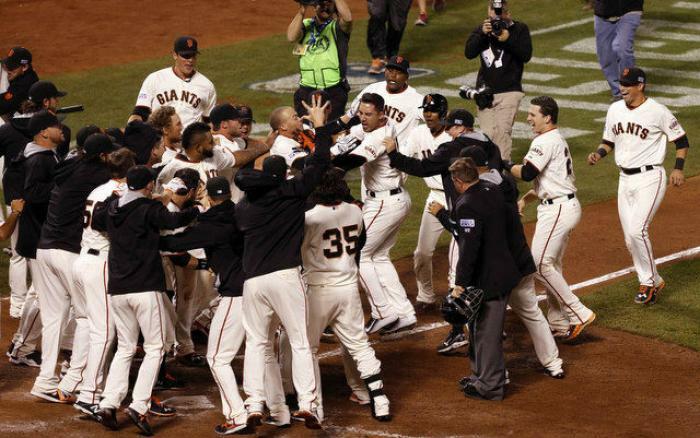 The San Francisco Giants are heading to the World Series to battle it out with the Kansas City Royals on October 21. Ishikawa was part of the Giants back in 2010 when they took the championship. He played for four other ball clubs after that season, before the Pittsburgh Pirates released him back in April, where he was signed back on to the Giants roster. When the Giants do play next, they'll lack some of the key players they had for the 2010 and 2012 postseason. Matt Cain and Tim Lincecum, who were invaluable assets to the team during those years, are gone. Cain had elbow surgery in August and hasn't sufficiently recovered, and Lincecum hasn't come out of the bullpen since September. The Giants will start their series against the Royals on October 21.